Few of the early spring wildflowers continue blooming through summer and autumn, but Red Campion is a very welcome and colourful exception. Up to a metre in height, these perennial wildflowers usually have downy stems and stalkless upper hairy leaves in opposite pairs. The leaves are entire (not toothed) and oval with pointed tips, and near the base of the plant they have short stalks. Each with five petals, the flowers are typically 1.5 to 2 cm across and occur in various shades of pink. Petals are cleft, sometimes quite deeply indented giving the impression that there are ten rather than five petals. Typically 2 to 2.5cm across, the unscented flowers are termed dioecious, which means that the male and female flowers occur on separate plants. This lowland wildflower is found throughout Britain and parts of Ireland. It is also common in some northern and central European countries but much less so in southern Europe. A splendid plant of hedgerows, woodland edges and tree-lined riverbanks, Red Campion is much loved for its dense flower masses that last all through the summer. In Britain and Ireland the first flowers of Red Campion appear in mid-May, and from then until September or early October you will find plenty of Red Campion in bloom - indeed, it is not unusual to find a few late flowers at Christmastime and, in mild winters, even into the New Year. Red Campion is at its very best in June and July. Silene, the genus name, is a reference to the Greek woodland god Silenus the foster father of Bacchus, who was often depicted covered in a sticky foam and whose name in turn comes from the Greek word for saliva; the female flowers of Red Campion secrete a frothy foam that captures pollen from insects that come to the flowers to gather nectar. The specific epithet dioica means 'two houses', and signifies that separate plants bear the the male and the female flowers. Male (on the left) and female (right) flowers of Red Campion always grow on separate plants. Plants of the genus Silene have roots that contain the chemical compound saponin, which although a mildly toxic substance has long been used as soap for washing clothes etc. 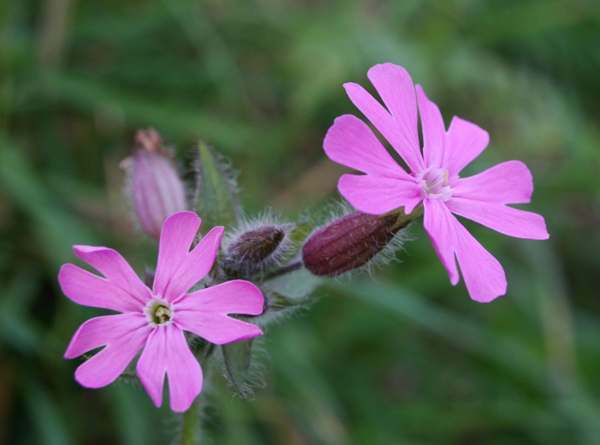 There are also references to Red Campion being used to treat snake bites and as a cure for corns and warts. 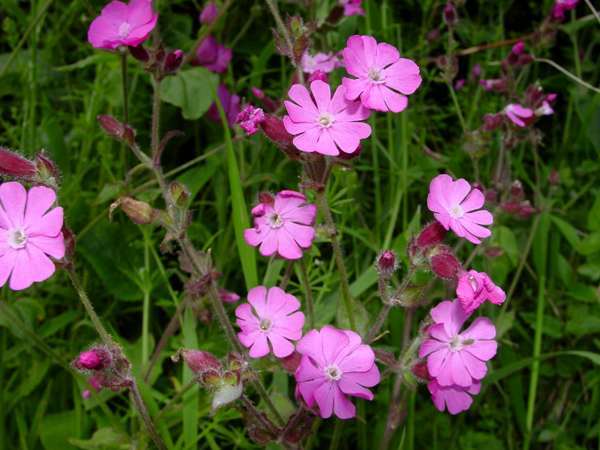 Most Silene dioica plants produce pinkish-red flowers. When you come across pale pink forms they are likely to be the result of hybridisation between Red Campion Silene dioica and White Campion Silene latifolia. 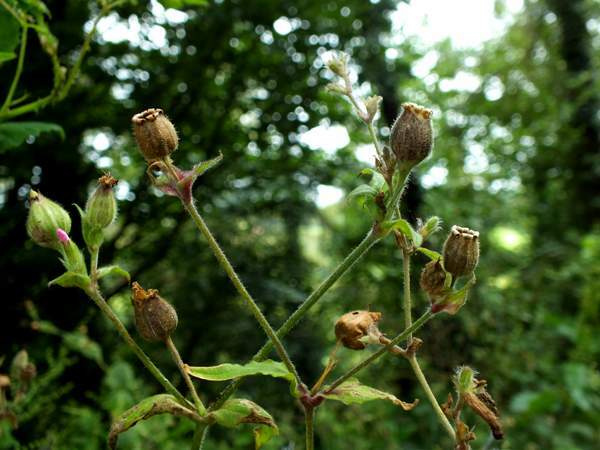 Above: seed capsules of Red Campion. Silene colorata is a Mediterranean species with smaller pink flowers that are more deeply notched; it also has a less robust growing habit. Ragged Robin Lychnis flos-cuculi grows mainly in damp grassland and has very spidery divided pink petals. 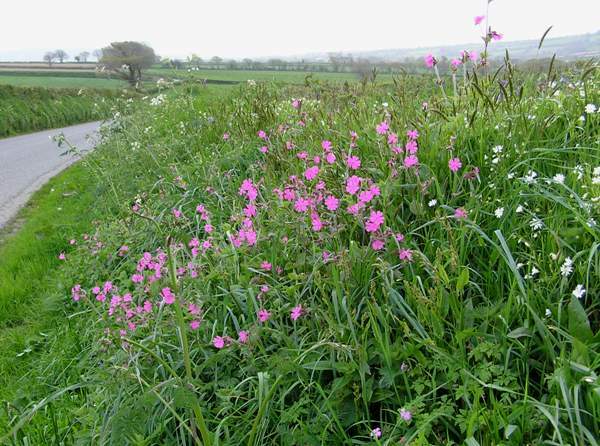 The pictures of Red Campion shown on this page were taken in West Wales during June, July and August.